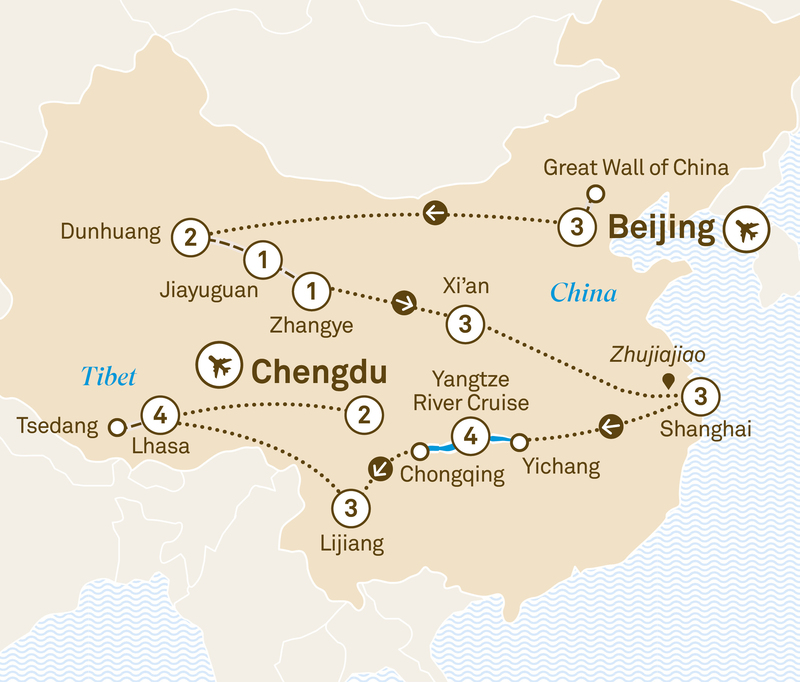 There are many jewels on this itinerary, from Beijing to the Gobi Desert and the mighty Yangtze River to the Tibetan Plateau. And some of the most captivating of them all are the jewels you’ll chance upon along the way. This journey is not about discovering Tibetan Buddhism, but it would be surprising if your encounter with this beautiful aspect of Tibet and Western China leaves you completely unmoved. From the Mogao caves and grottoes to the Samye Monastery and Potala Palace, the outward beauty of Sino-Tibetan Buddhism is on full display on this itinerary. However, you can also look forward to so much more. Discover exciting Shanghai, delight in unique Xi’an. Indulge in China’s incredible cuisine and in the visual splendour of its greatest waterway. When all is done, you may find yourself changed by all you’ve seen and experienced. And that of course will be the finest jewel of all. Disembark and visit Ciqikou and take a tour of Chongqing before flying to Lijiang. Over the next three nights you’ll enjoy a Special Stay, perfectly located in the old town. Walk around Lijiang’s World Heritage-listed Old Town. This afternoon is at leisure to explore on your own. Try Sichuan and Yunnan specialties, or a restaurant serving Brazilian and South East Asian cuisine. Explore Black Dragon Pool, then witness the Impressions Lijiang outdoor cultural show. Drive to Jade Dragon Snow Mountain National Park for a gondola ride to Spruce Meadow. Welcome to the rooftop of the world where you’ll spend four nights in Lhasa. Enjoy an international buffet, Cantonese or Sichuan cuisine. Explore Drepung Monastery or visit the Chakpori thousand-Buddha cliff stone carvings and Norbulingka. Alternatively, visit Anitsamkung Nunnery and a local tea house. Travel to Sera Monastery and witness the daily debate on the doctrines and teachings of Buddha. Join pilgrims strolling along the holy Barkhor Circuit to Jokhang Temple and visit Tibet’s iconic Potala Palace. Enjoy a Tibetan dinner with traditional music and singing. Travel to Samye Monastery and Tsedang, the cradle of Tibetan Civilization, visiting local families en-route. Fly to Chengdu and wander along Jinli Street. Enjoy a two night stay. A choice of Sichuan cuisine, ribs and burgers in an Irish pub, or an international buffet dinner. Tonight reminisce about your holiday at your farewell dinner. It’s time to bid farewell to China with many wonderful memories.